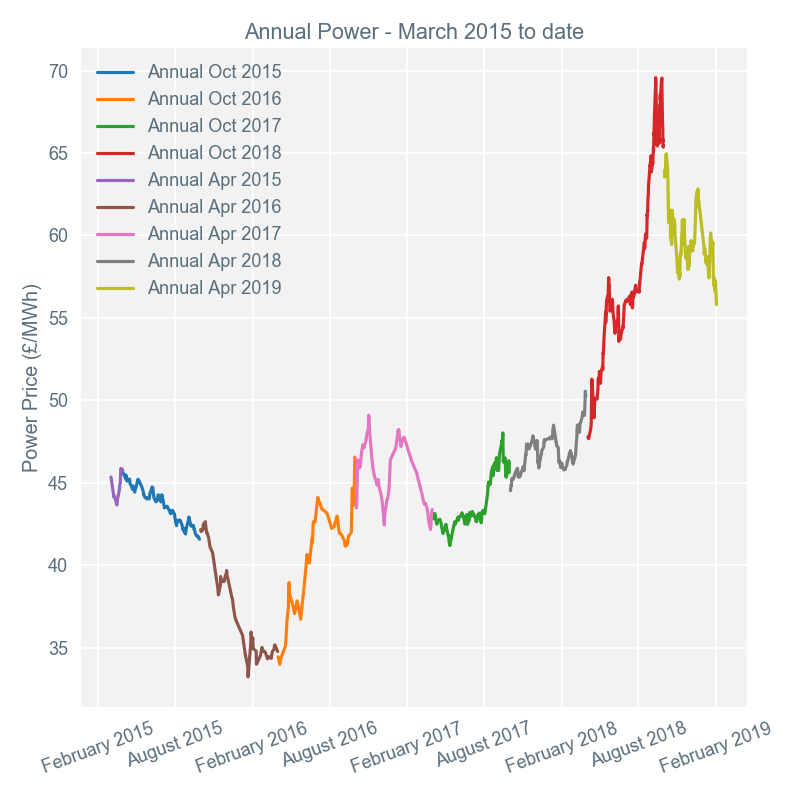 Day-ahead prices averaged £58.47/MWh over a week with mostly high levels of wind output and cold temperatures. 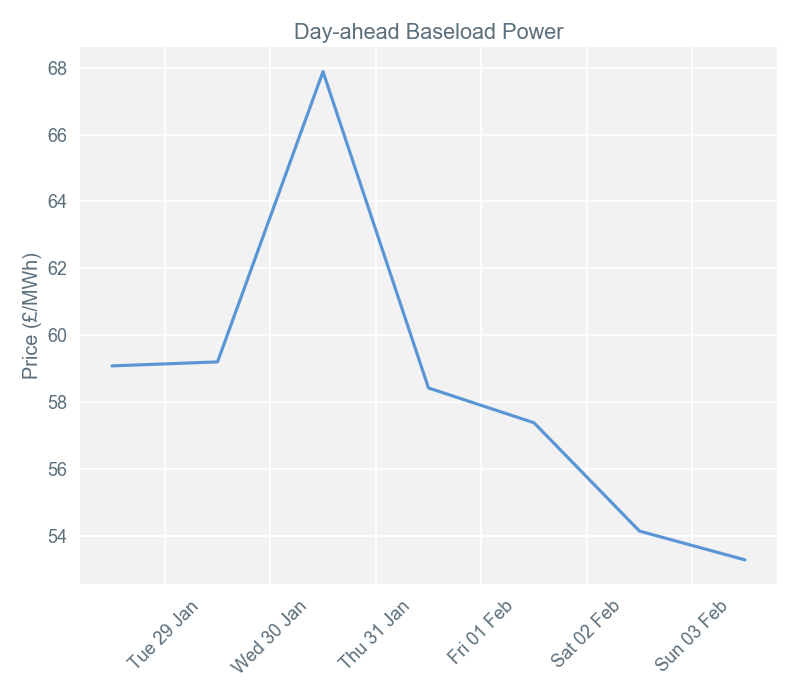 Baseload power for delivery on 30th January was the highest price for the week at £67.83/MWh. This strong gain, in an otherwise bearish week of falling prices, was due to a significant drop in wind generation leading to an increase in the demand for gas. 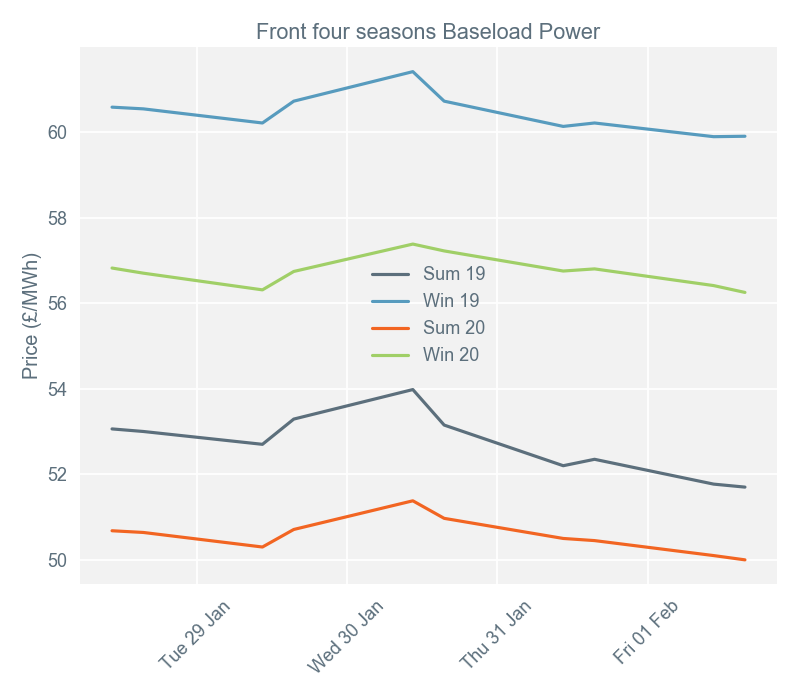 The lowest price for day-ahead baseload power delivery was for 3rd February, when the forecast was for wind output to increase to 7.3GW and power demand to drop to 36.1GW. During week 5, settlement period 15 (07:00-07:30) on 28th January and settlement period 16 (07:30-08:00) on 31st January shared the highest imbalance price of £140/MWh. On both days, the colder weather during these early periods increased the cost of actions available to National Grid. A price of -£50/MWh was the lowest of the week, for settlement period 42 (20:30-21:00) on 29th January. During this time, wind generation picked up as demand decreased for the evening. There was a strong start to week 5 for wind generation, before a significant dip occurred on January 30th and 31st. Then, heading into the weekend, generation began to increase again - reaching the highs seen earlier in the week. 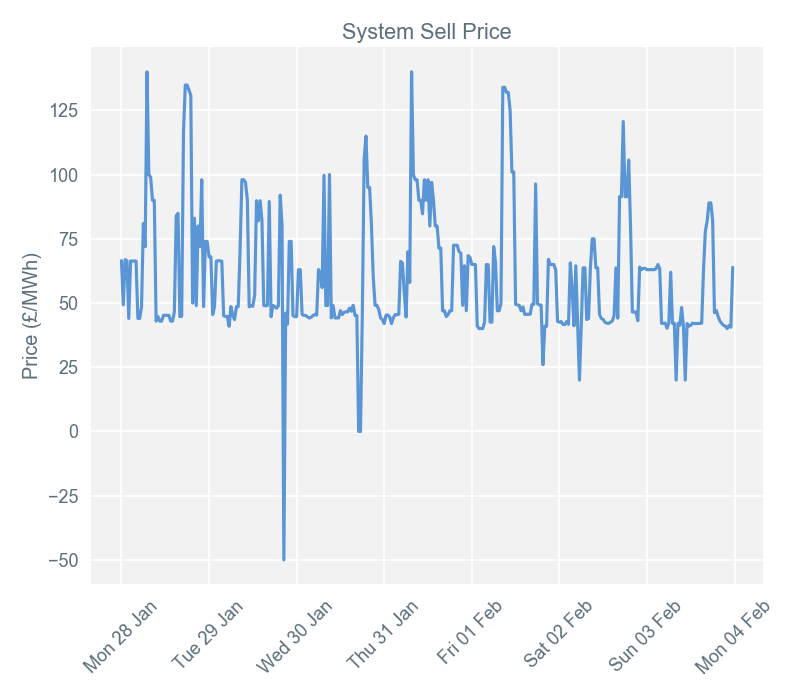 These fluctuations had significant influence over the day-ahead and system prices. Demand peaked at 48.9GW on 30th January, with wind generation contributing 2.2GW (4.4% of the generation mix). 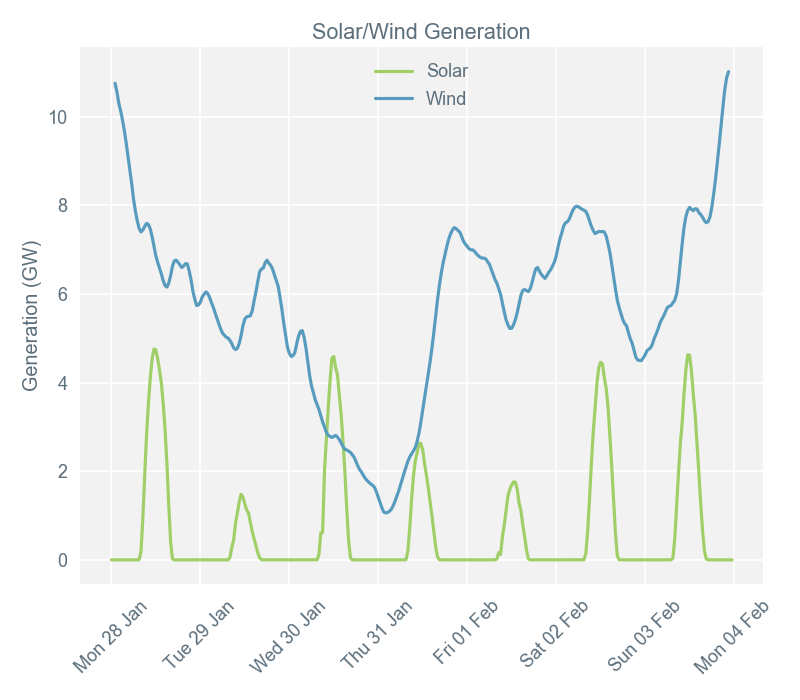 Interestingly, a similar level of demand (48.8GW) on January 28th saw the wind contributing 14.5% to the generation stack. Secure and promote* (Seasons +1, +2, +3, +4) baseload contracts lost on average £0.82/MWh over week 5, as the downward trend continued. Germany’s announcement of plans to phase out coal and lignite generation completely by 2038 saw carbon contracts trade down for most of the week. The carbon-intensive nature of coal generation provided further downward pressure on the already bearish gas market. Stocks of Liquefied Natural Gas (LNG) stocks reached a multiyear high, due to increased imports amidst falling Asian demand bolstering a well-supplied system. The easing of concerns about the impact of a major cold snap also reinforced the weakness of the National Balancing Point (NBP) for gas.